Our biggest release to date has finally arrived! We're proud to continue to add helpful new features so you can tackle the PTCE with confidence. Thanks for making us the top brand in mobile test prep! Pocket Prep is a powerful exam simulator that allows you to create customized practice tests, view your results, and get detailed answer rationales with just a few taps. Set up study reminders, countdown to your upcoming exam, and test your understanding of PTCB® concepts like never before. No matter where you are, you can fire Pocket Prep up to keep your mind focused and sharp. 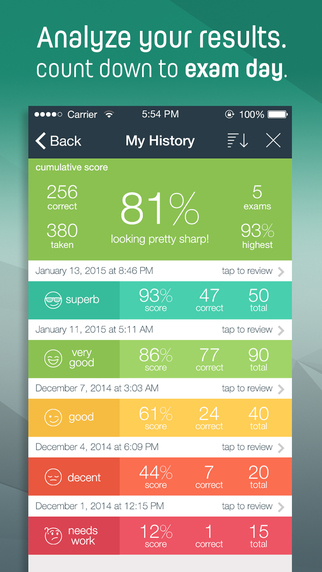 Pocket Prep apps share the same quality standards as the big printed test prep companies. Our team of writers and editors meticulously craft practice questions and detailed answer explanations with you in mind. Your success is our success. We’re dedicated to bringing you the best content that will help you achieve more. Our PTCB® app is up to date with the latest exam standards and is ready for 2015 testing. PTCE® is a registered trademark of the Pharmacy Technician Certification Board (PTCB®) and administered exclusively by the PTCB®. This material is not endorsed or approved by the PTCB®.